Dear Mr. Patterson, thank you for your kind words, I understand you are doing this as a volunteer. I appreciate this very much. 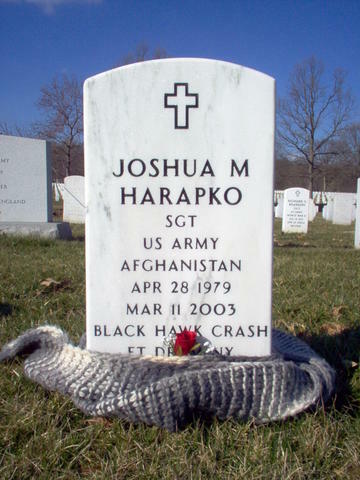 I picked Arlington for Josh because it is an honor for the soldier he had become...but My Josh was the baby, the boy, the man still forming, and Arlington is far from home so when I visit his website in the future it will be some comfort to me if it can introduce others to Josh himself. 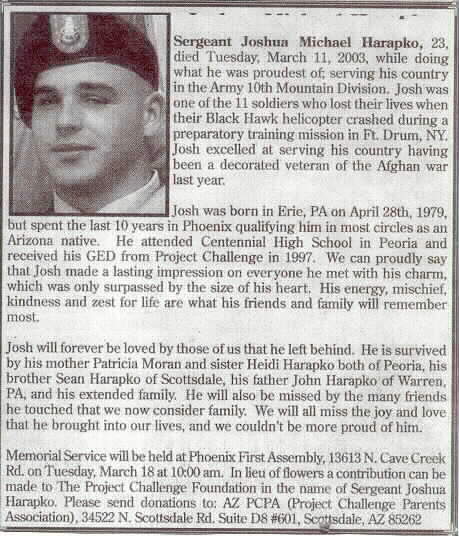 I have already forwarded an article from the Miami Herald website written about Josh for their Memorial day issue. Hopefully you received it. 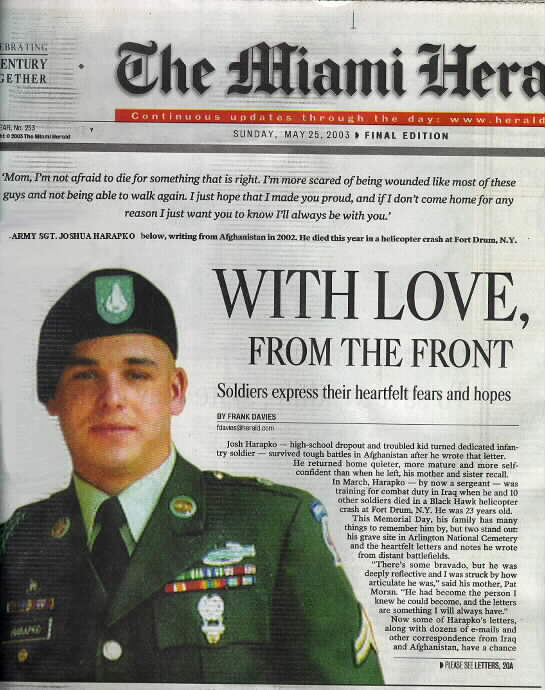 I am attaching the front page of same article because it includes quotes from his letter to me written in Afganistan and the article explains that this same letter is now included in the book "BEHIND THE LINES" by ANDREW CARROLL (I will also send the entire letter and his obituary). 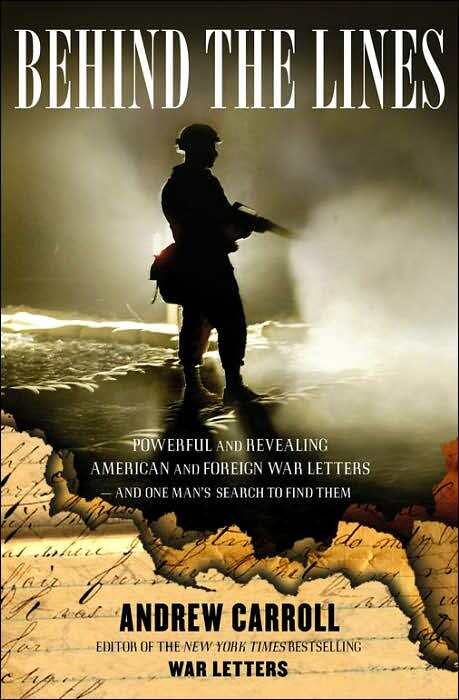 The article also continues to include letters from other soldiers still living and does not need to be on his site. 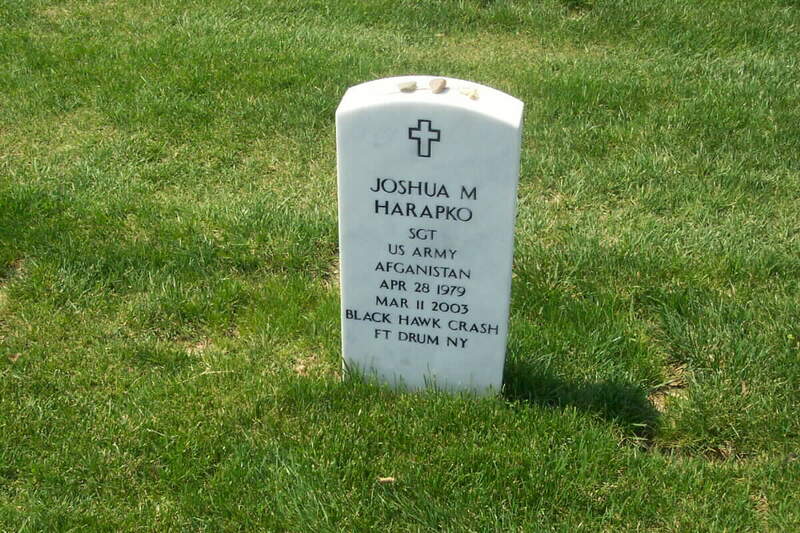 I will attach photos with his siblings ...his brother is Sean Harapko, and his sister is Heidi Harapko. It may be necessry to send more than one email. Thank you very much, Pat Moran, July 2003. I'm writing this letter before I leave. I couldn't say what I wanted to over the phone. First I want to say I love you so much. You were always there for me even though I would never talk about my problems. Second you gave me the options to be a man giving me slack in the rope to try to make the right decisions. No matter what, you always believed in me, no matter how much of a punk I was to you. We are leaving to Bahgram to flush out 600 Taliban soldiers from the mountains. This is the biggest battle of the war on terrorism. We already sustained 30 casualties and one KIA. I never thought war was fun. It's hard to see all the guys who were shot or wounded and to know you're going right back in there. I thought you should know where I am. I don't want you to worry about me. (I know you will cause I'm your son). Mom I'm not afraid to die for something that is right. I'm more scared of being wounded like most of these guys and not being able to walk again. I just hope that I made you proud, and if I don't come home for any reason I just want you to know I'll always be with you. Really you shouldn't worry though. My guardian angel (Peg) is with me. I didn't get ahold of Sean, but please tell him I love him. I remember when I used to tell him to stop acting like my Dad. We'll tell him I really respect him for that. I wish I could have told him myself. I wish we could have hung out together more and I regret not being able to. I want you to know you raised the cream of the crop. I haven't been able to contact Heidi so please tell her I love her so much. I'm so proud of her. I want her to know that. I wish I wasn't such a brat when she was around. These are just some things I needed to justify before we move out. Tell Aunt Kathy my prayers are with her and Uncle Joe. Tell Nikki I hope to be there for her wedding. Tell Aunt Barb and Uncle Kevin I love them. The same to Aunt sharon and the kids and Uncle Bob. If you go to Steve's graduation tell him how proud I am of him. For Lauren tell her I liked hanging out with her and her roommates. Also good luck and congratulations. To Marcie and Dave you were just like blood brother and sister and I love them like family, and to little Jake happy birthday. Well Mom I have to go now, all that I have said here are words from my heart and I mean every last one of them. Tell Aunt Joyce I said hi and I love her. I hope to see you soon but if thaat doesn't work out I just needed you to know how I felt. I Love you and Miss you. Take care your always in my thoughts. 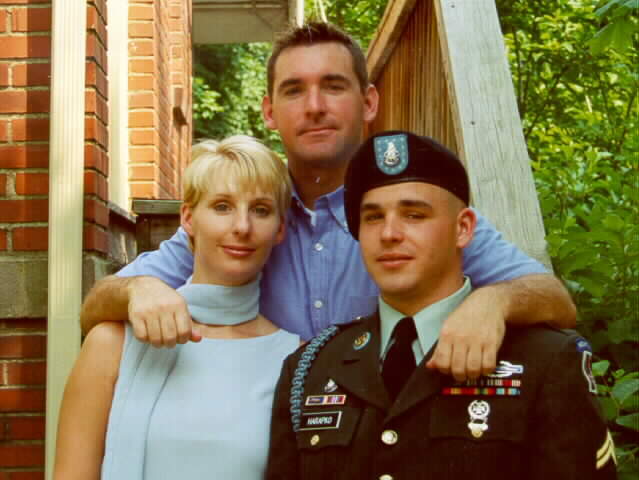 Joshua'a family immediately following his Fort Drum, New York, memorial service. 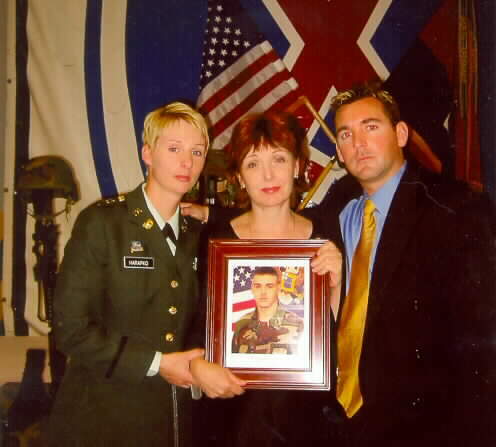 (l-r) Heidi Harapko, Warrant Officer, United States Army, Pat Moran, and Sean Harapko. Sean: " some of Josh's first words were "little buddy and big buddy"...we have had many different roles over the years, bro...mentor...role model... but the best was the last...best friends, the kind of friend that you could be with in a room, say nothing at all and be having the best time of your life. We have once again transitioned roles...Josh being "my little hero"! 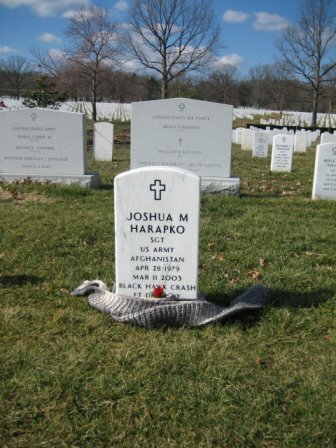 U.S. Army Sergeant Joshua Harapko, 23, was a veteran of Operation Anaconda, the largest ground battle fought by U.S. troops in the Afghanistan campaign. 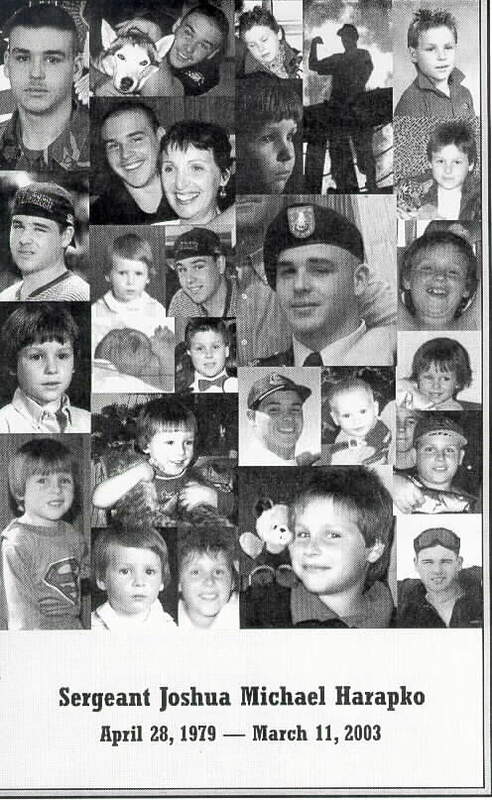 FORT DRUM, N.Y. (Army News Service, March 18, 2003) -- The 10th Mountain Division (Light Infantry) and surrounding community joined together to say a final farewell to 11 soldiers at a memorial service March 14 at Wheeler-Sack Army Airfield. The service was attended by 85 family members and more than 2,000 mourners, including U.S. 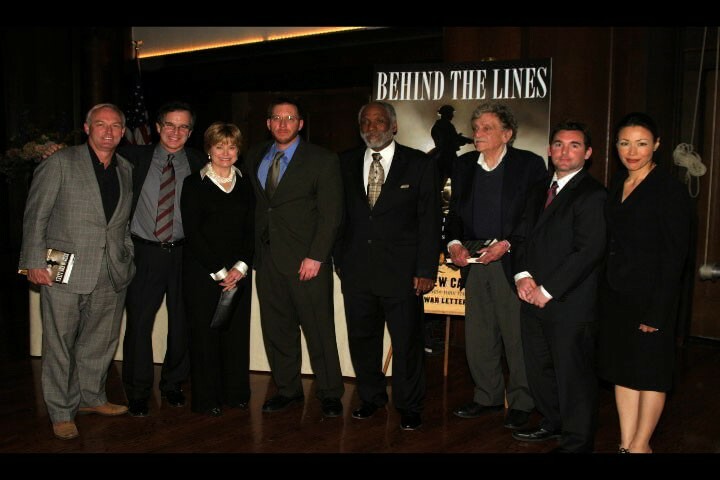 Senator Hillary Clinton; Congressman John McHugh; New York Governor George Pataki; Secretary of the Army Thomas E. White; the civilian aide to the secretary of the Army for New York, Tony Keating; the Vice Chief of Staff of the Army, General John M. Keane; State Senator Jim Wright, and State Assemblywoman Dede Scozzafava. Members of 1st Battalion, 10th Aviation Regiment said goodbye to Captain Christopher E. Britton. Soldiers of 2nd Battalion, 10th Aviation Regiment remembered Chief Warrant 3 Kenneth L. Miller, Sergeant Lucas V. Tripp, and Specialist Barry M. Stephens. Fellow warriors from 4th Battalion, 31st Infantry Regiment mourned Staff Sergeant Brian L. Pavlich, Sergeant John L. Eichenlaub Jr., Sergeant Joshua M. Harapko, Specalist Shawn A. Mayerscik, Private First Class Andrew D. Stevens, Private First Class Stryder O. Stoutenburg, and Private First Class Tommy C. Young. 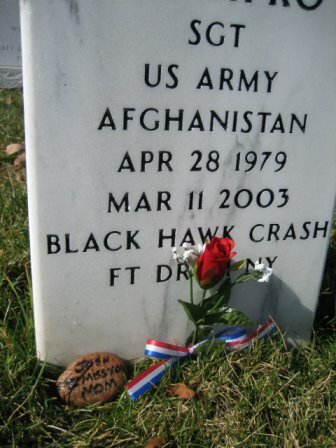 All of the soldiers died in a Black Hawk crash March 11. Their cohesion and brotherhood as well as their willingness to do anything for the Army or each other made these soldiers special, said Major General Franklin L. Hagenbeck, 10th Mountain Division and Fort Drum commander. "This accident serves as a stark reminder of what we as a nation ask our young soldiers to do - to train hard, under difficult conditions, and to be prepared for any mission given, even at the risk of death," Hagenbeck said. "We are blessed as a country to have such men, and we in this division are honored and privileged to have served with them," he added. Leaders heralded the hard work, dedication and professionalism of the 11 soldiers. "We recognize this type of dedication as one of the noblest pursuits an American soldier can make," said Colonel Shane Deverill, 10th Aviation Brigade commander. "These great soldiers were dedicated to the service of this nation. They represent the best of America: Proud to do their duty, professional in their abilities, and prepared with the skills necessary to win a decisive victory in whatever missions that came their way." Commanders from each of the soldiers' units took time during the ceremony to honor and remember these soldiers who made the ultimate sacrifice while serving their nation. "It is impossible to make sense of any tragic loss, and our loss today is no exception," said Colonel Kevin Wilkerson, 2nd Brigade commander. "However I do know that these men believed in what they were doing and knew that it is important. Every one of them was proud of what he was doing." 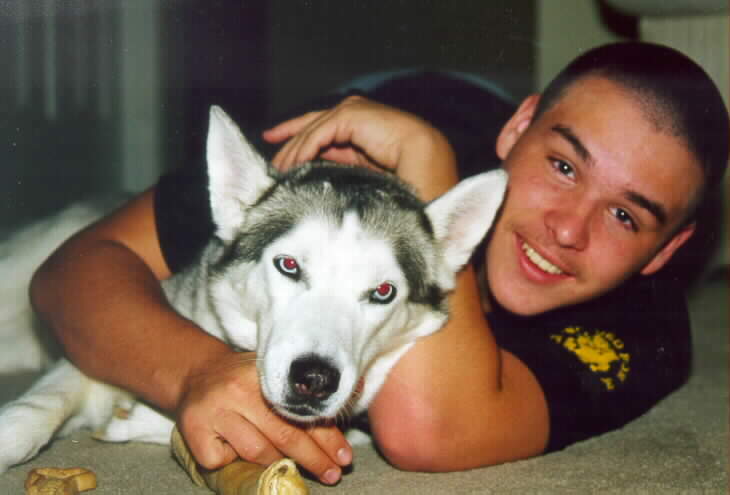 "Chris, Ken, Brian, John, Josh, Luke, Shawn, Barry, Andrew, Stryder and Tommy died in service to this nation, and their loss is every bit as much the loss of a hero as it would be in any other combat situation," Wilkerson said. Battalion commanders remarked on the individual qualities of their soldiers and the great loss the Army has suffered by their death. "I believe the Army is a reflection of the soldiers in it," said Lieutenant Colonel Elvin Gunter, 1-10 Aviation Regiment commander. "Right now we are poorer for the loss of Captain Britton. In his two years with us, this spirited officer touched many lives. 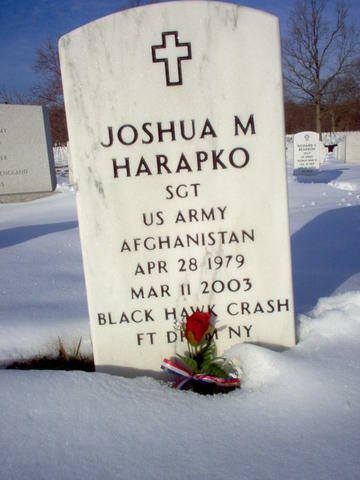 He enriched his section, the soldiers he dealt with, and the battalion as a whole." Lieutenant Colonel John M. Spiszer, 4-31 Infantry Regiment commander, expressed his feelings for the men lost under his command. 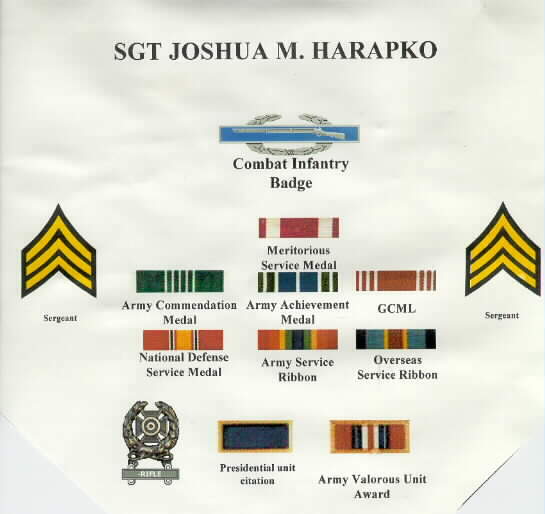 "Staff Sergeant Pavlich, Sergeant Harapko and Sergeant Eichenlaub held three different MOSs (military occupational specialties), had three different styles, but they were three very fine leaders, and I was always proud of what they did for us," Spiszer said. "The soldiers Specliast Mayerscik, and Privates First Class Stevens, Stoutenburg, and Young were in three different sections of the company headquarters, but were all hard-working, motivated, and talented soldiers. They provided an example that we should all look to emulate," he added. Other leaders pointed out some of the individual qualities of the men with whom they served and worked. "We will never forget Ken Miller's smile and quick humor, never forget Luke Tripp's positive eager attitude, and never forget Barry Stephens' quiet professionalism," said Lieutenant Colonel Scott Zegler, 2-10 Aviation Regiment commander. 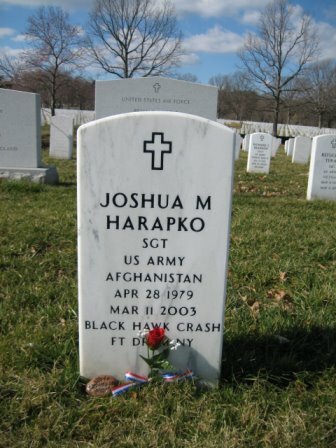 The tragic loss of March 11 will be one that will be remembered by those who knew the warriors who trained to fight and gave the ultimate sacrifice doing just that. "We will, for years to come, ask ourselves why. Why on March 11, why on this flight, why on this mission were our friends taken away so quickly?" Zegler said. ARLINGTON, Va. - "Taps" is played here two dozen times a day, the notes as haunting and lonely as death, this hallowed ground's abiding presence. In Arlington National Cemetery, where the nation buries many of its war dead, horse-drawn caissons bear flag-draped coffins across a sea of white, military-issue tombstones. Buried here are those who served in Vietnam, Korea, the two World Wars, the Civil War, the American Revolution. Young warriors barely past voting age and old retired vets lie next to each other, grave locations dictated more by logistics than military accomplishment. "There is no rank structure in death," says cemetery spokesman Tom Findtner, a line that sounds well-used. More than 285,000 people are interred in the cemetery's 624 acres, and 25 to 27 are added each day as the World War II veterans move through their 80s. Also buried here are former presidents, slaves, astronauts and members of Congress. During the height of the Vietnam War, as many as 40 funerals took place daily. Funerals occur on weekdays, but after the September 11, 2001, terrorist attacks they were conducted into the evening and on Saturdays to accommodate victims from the plane crash into the nearby Pentagon. If U.S. casualties in Iraq - 107 as of Friday - produce a large number of dead, the cemetery would again expand hours, said spokeswoman Barbara Owens. Burial space is tight, and the cemetery plans to add 43 acres from adjacent military property. Lack of space has brought restrictions on who is eligible for in-ground burials. 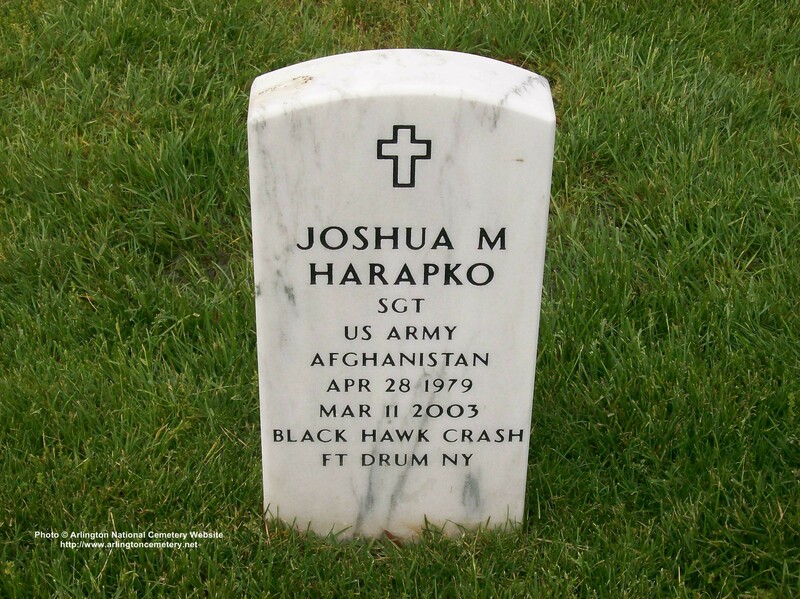 Relatives are interred in the same plot as their military personnel, where possible, and the cemetery encourages use of the columbarium, a facility for cremated remains. Some of the dead, like Captain Russell B. Rippetoe, 27, an Army Ranger killed last week when a car bomb exploded at an Iraqi checkpoint, died in military action and came home to the honors accorded a war hero. 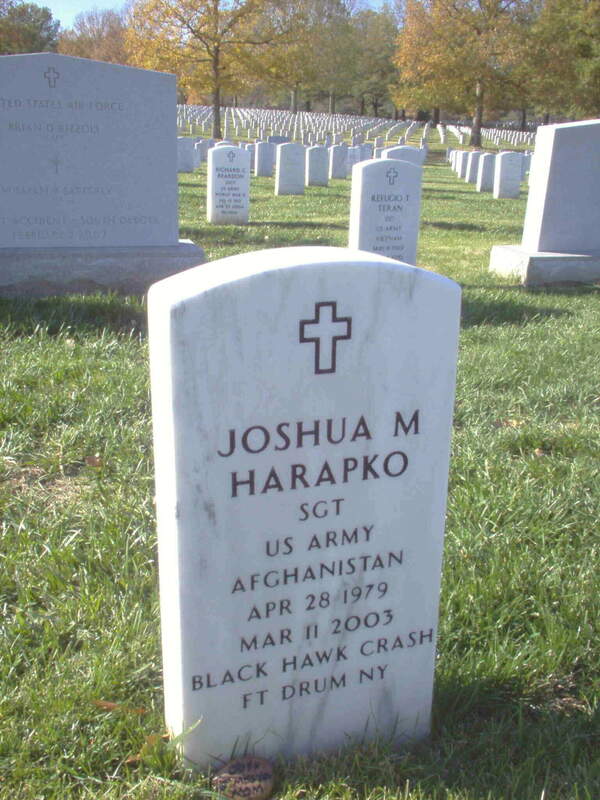 He was the first U.S. military casualty buried here from the Iraq war. As befits a place that has been burying heroes since 1864 - pre-Civil War dead were moved here after 1900 - the rituals are many and precise. One, the changing of the guard at the Tomb of the Unknowns, is a major attraction for the 4.5 million tourists who stream through cemetery gates each year. It was President Kennedy's televised funeral that gave many Americans their first sight of the horse-drawn caisson, an open-air carriage that carried Kennedy's coffin here from Washington, just across the Potomac River. On Thursday, the caisson carrying Rippetoe's casket was pulled by a team of six matched grays and escorted by a seventh ridden horse as a military band played "Battle Hymn of the Republic" and later, "America the Beautiful." Seven soldiers fired rifle volleys - the number of shots depends on the deceased's rank. Then came "Taps" - played for all funerals - as a lone bugler stepped apart from the band and blew his solitary notes. Rippetoe's father, a retired Army officer disabled during Vietnam combat, sat in uniform with his wife Rita as the Army presented them with their son's posthumous medals, among them the Bronze Star for valor. "On behalf of the president of the United States and a grateful nation, I present you with this flag as a token of the honor and faithful service of your loved one." Joe Rippetoe returned the salutes of his son's fellow Rangers. The family received a formal condolence card from a member of the Arlington Ladies, a women's group that sends someone to every funeral. That tradition began in 1972 after an Army general happened on a burial with no mourners. Even as Rippetoe's funeral was ending, another was beginning. On a road nearby was parked a yellow backhoe, its driver waiting for the mourners to leave so the more practical tasks of burying the dead could go forward. Rippetoe's grave - No. 7860, Section 60 - is in an area where reminders of war's cost in young lives are inescapable. 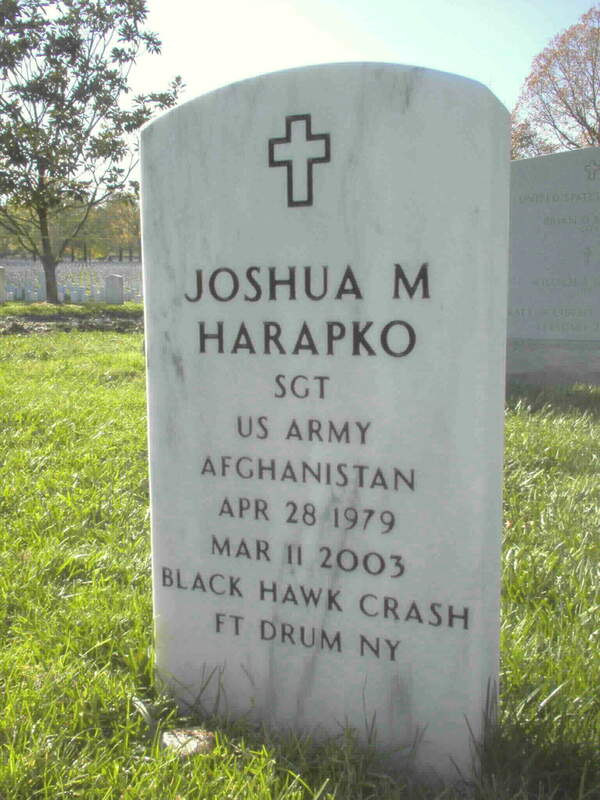 Behind his is a grave with the remains of two soldiers killed when their helicopter was downed in Southeast Asia in 1971. Next to Rippetoe lie Sgt. 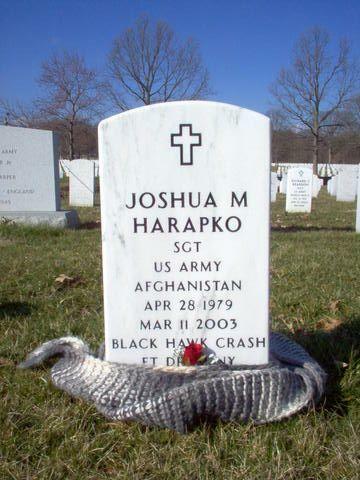 Joshua M. Harapko, 23, and Private First Class Shawn A. Mayerscik, 22, killed in a March 11 helicopter crash at Ft. 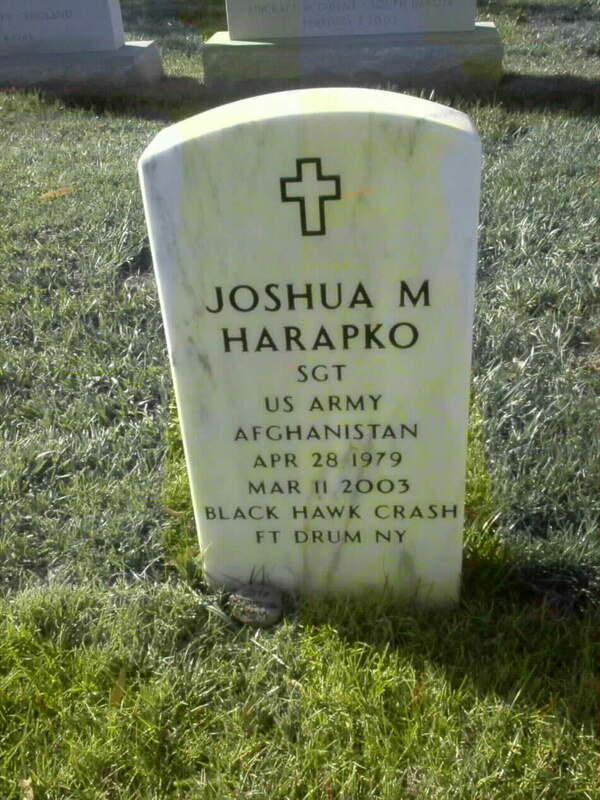 Drum, N.Y. Their graves, like his, are too new to have received the tab-shaped white marble markers that are standard issue here. 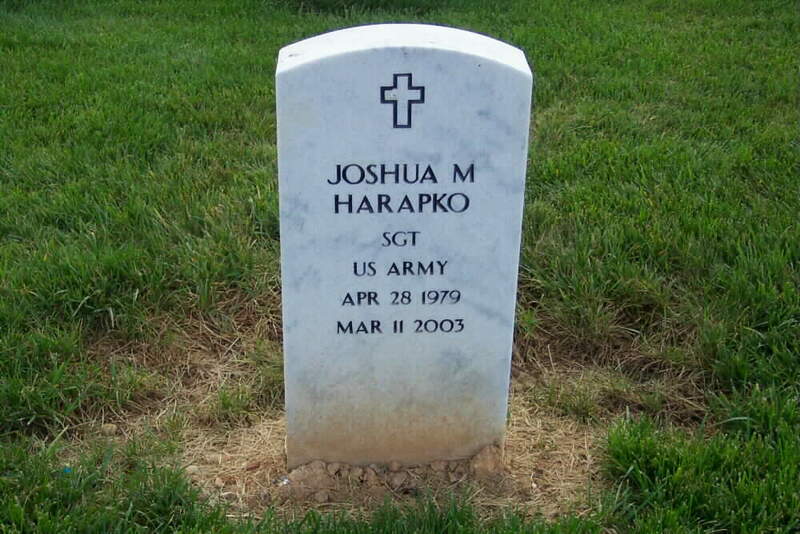 Funerals are scheduled next week for more Iraq casualties, among them Marine Second Lieutenant Frederick E. Pokorney Jr., 31, who died March 30 in an ambush near Nasiriyah. Like Rippetoe, who coordinated artillery from the ground, Pokorney had a dangerous field artillery job. Pokorney's uncle, Richard Schulgen, said in an interview his nephew had wanted the honor of being buried at Arlington, where a grandfather and great uncle are also laid to rest. An enlisted man, Pokorney had recently become a commissioned officer and was proud of his service to his country. "He was proud of what he was doing and proud of his family, a hardworking guy - the best guy you can ever know," said Schulgen. "I hope the American people don't forget."